I promise to use it only to send you The Sales Buzz. Sales Presentation tips will show you how to make a confident sales presentation using proven sales skills to present only what the buyer wants to see and hear. What to present and in which order. How to present it and keep the attention of your buyer. The most effective way to use Features and Benefits. Avoid a common mistake that many sales people make. And you can have a free sales presentation training tool that has proven successful for many people like you. The sales process is how you, and the buyer, get from your first introduction to closing the sale. It can take place over more than one meeting, or in a just a few minutes, depending on what you sell. It could be a quick impulse driven sale in a retail environment, or a full scale formal affair with slides, videos, demonstrations, and a tendering process. The sales process, and the sales presentation tips will work for you. Below you can see how the sales presentation tips fits into the sales process. The sales process my working sales teams use. ...Click on any of the links to take you to the sales training page for that stage of the sales process. If you want an overview of the sales process open the Sales Process page..
After a confident sales introduction, you’ve used great sales questioning techniques to discover what the buyer wants, needs, and desires. Now it’s time for an effective sales presentation to show how you can fulfil those requirements, and move you towards closing the deal. If you have followed the sales training in the Sales Questioning section of the site at this point you will have a clear understanding of what the customer wants. As you questioned them about their needs you will have noted, or remembered, what was important to them, and what they wanted the product or service to do for them. Less experienced sales people present the features of the product. They bore the buyer with unwanted details about the product rather than what the product will do for them when they buy it. A Feature is what the product or service does, how it works, what it looks like, the mechanics of it. A Benefit is what the features do for the customer. A feature of this website is the information it will give you to add to your sales presentations. A benefit of that feature is the extra income you can earn as a result of the additional sales you will close. Every feature can have lots of benefits. Many features can have the same benefits. The information you find on this page is a feature. The benefits are endless and all result in you gaining something. If you were buying a new car for your family you would want to know about the safety features. You would be interested in what those features will do for you and your family, how safe you will be, rather than the technical specifications. When you bought your last pair of shoes did you ask what they were made of? What type of stitching was used? Were the laces a natural fibre? How was the sole made? Or, did you try them on and feel the benefit, and look in the mirror and see the benefits of how good you looked? That's why you bought them, because you saw and felt the benefits. Take the test. Test your sales presentation and see how effective it is. Measure how customer focused it is and how you could change it to help you close more sales and earn more money. Open the sales presentation training test and make some profitable changes. Using the information from the sales questioning stage of the sales process, pick out the key needs that the buyer is looking for. Now match those needs to the features of your products or services that can provide benefits to meet those needs. The sales presentation tips at this stage tell you to start with the customer’s needs and work back to your product. If you do it the other way around you will find you are presenting features of your product that are of no interest to the buyer. By targeting the key benefits you are getting straight to their reasons and motivators for buying, and that will make closing the sale a lot easier. Once you have matched the needs to the best features that give benefits that meet those needs, start presenting. Make the benefit the major focus of each part of your sales presentation, not the feature. Present only the benefits the buyer has told you they want. Include any visual, auditory, or kinaesthetic aids you have for your product or service. Models, samples, slide shows, or a chance to try out your product. Include all the senses wherever possible. These sales presentation tips become more important if your sale is driven by impulse and emotion. After you have presented the features and benefits that meet one key need, gain confirmation that the buyer agrees that you have met their requirements. Some people call this a trial close and that’s a good description. By gaining agreement all the way through you are making closing the sale a lot easier and picking up signals that you are going the right way towards closing the deal. The more agreement you gain from the buyer the closer you are to winning the order. Continue presenting to meet one key need, want, or desire, until you think you have met all the buyer’s requirements. Then ask them if they agree that you have. Have you missed anything, is there anything they have thought of since telling you what they wanted in the questioning stage of the sales process. Once you’ve completed your sales presentation, and gained agreement from the customer that your sales proposal will meet all their needs wants and desire, you can move on to closing the sale. Open Closing the Deal for more on how to close throughout the sale. Linking the buyer’s needs, wants, and desires, to the features and benefits of your product, and then gaining agreement, is a really useful sales skill. I have developed a sales training tool for my sales teams that builds up this skill and will help you to present a smooth sales presentation and close sales using a smooth process. It’s called the Needs-to-Close chain and my sale teams have used it with great success. We’ve also found it to be a fantastic way of getting sales people into a selling state. It’s a learning tool, a motivator, and a great way to build a sales presentation for a new product. And you can get it for free with the Free Sales Training Newsletter we call The Sales Buzz. Click the link and get hold of this unique sales presentation tips tool completely free of charge. These sales presentation tips come from the sales training I have developed working with the sales teams I manage and train. My career and income depends upon the sales results achieved by the training. For this reason it has to be practical, easy to use and put into action, and most of all it has to get results. You are probably aware that achieving the sales results you want depends upon how effectively you put this sales training into action. 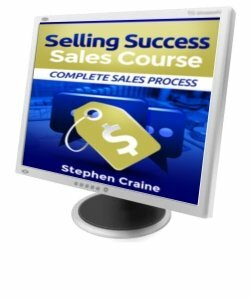 To help you do that I’ve now made this sales training available in a workbook that guides you through an exercise program to build all the stages of a sales process. From the first introduction to the prospect, the sales questioning stage, sales presentation tips, to closing the sale. And a section on overcoming sales objections. The sales training workbook is written specifically for sales people, self employed and small business owners. It has proven successful in B2B sales, Field Sales, Retail and Showroom, Direct Sales to the public, and Telesales. Open Sales Training Course and see if you think it’s reasonable. All 4 sales training courses in one complete package and with a special 30% discount on the usual price. See the professional sales appointment workbook training course that I use with my sales teams. How to overcome sales objections gives you an easy to use 4 step process for handling all sales objections. You'll learn how to close more sales, and earn more money or grow your business. 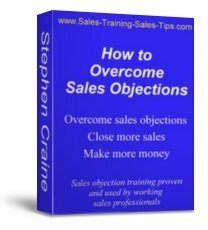 Because the techniques are practical, and developed while working with real sales professionals, you can have this sales objection workbook working for you today. Create an effective sales pitch for any product or service that you sell. Follow a step by step guide and you'll have a great sales pitch in your own words. Close more sales because you know how to use the stages of the sales process. Make use of all the skills and techniques you currently have. This is the sales training course that I use with my successfull sales teams. See proven sales techniques on how to close sales as a natural part of your sales process. Close more sales with confidence using closing skills that have been developed by working professionals. See ideas on how to close for your particular products and customer types. Plus: Avoid common closing mistakes. Tag the close on to your sales presentation. Know when to use one line closes or longer questions. 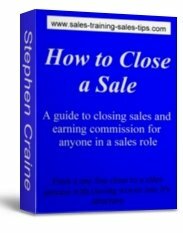 With this effective course on closing sales you get 40 pages of straight to the point training.